I have met many filmmakers who were avid skateboarders in their teens; some remain so today. Although scientists have yet to find a link between the two activities, but as they both encourage people to find their own personal style, you can see why there there is a connection. Of course, filmmaking and skateboarding go together like peanutbutter and jelly. And my favorite city is always the bread for two great tastes, as this film proves. Thanks to Gothamist for the tip on Josh Owens aka Mindrelic.com 's time-lapse photography! We call it The Ghost Station. 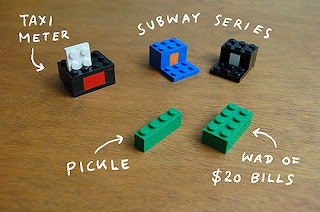 And Jalopnick has a post on "How To See New York's Secret City Hall Subway Stop"
Tomorrow at 2p-4P Lego Master Sean Kenny unveils a new sculpture at the Time Warner Center. It's about time. Now if they only would do it for subways too. And maybe people can be trained not to walk down into the subway when they see people coming up (don't they know a train has just arrived and left the station?!). How come this can't exist everywhere? Do you ever read the New York Times? You know that paper that your folks read? Maybe if they printed more articles like this instead just putting up on their blog then they could tap into that 8-12 year old market. Maybe we have to talk to them. 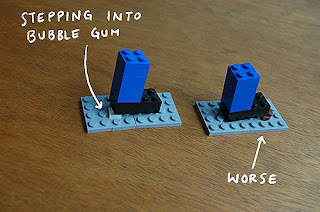 Anyway, we do a lot of minimalist Lego building in our bowl, but this Christof Neimann dude's got it done real good. Check out the full site as there are at least ten more than what we have included here -- and many are more pure NYC than what we've posted here. Big thanks to Mr. SkipHop for this one!